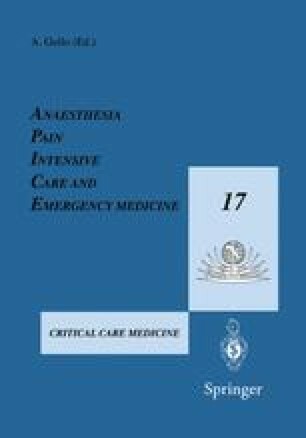 One of the main goals of medicine in anaesthesia and intensive care is to restore and maintain an adequate organ perfusion in the critically ill patient. To this aim, an accurate assessment of the cardiovascular system is mandatory. Among the different parameters used to monitor the cardiovascular system, circulating blood volume (CBV) is of paramount importance. While a severe reduction of CBV is associated with an easily recognizable clinical picture (i.e., shock state), a mild-to-moderate reduction causes only blurred clinical signs, due to the activation of compensatory mechanisms (i.e., normotensive compensated shock) . These rapid compensatory mechanisms include venous vasoconstriction and decrease of blood flow in the cutaneous, splanchnic, and renal compartments. This condition frequently occurs in critically ill and post-surgical patients and it is associated with increased morbidity and mortality. In fact, untreated hypovolaemia leads to a state of tissue ischaemia that is able to induce a systemic inflammatory response . On the other hand, an acute expansion of CBV can increase the volume of the interstitial compartment (i.e., oedema). This causes a reduction of the O2 diffusion capacity both at lung level (i.e., increase of the alveolar-arterial O2 gradient) and at the systemic level (i.e., increase of the capillary-tissue O2 gradient) [3, 4].